The IDP code consist of two modules – the aerodynamic solver and the trajectory analysis code. The aerodynamic solver is called ‘Non-Lifting Panel, 3D’, NLP3D, and is the AeroTex re-coding of the Hess-Smith “BOXC” panel method which featured in an early NASA sponsored 3D droplet trajectory code. Much of the basic algorithm is retained, unchanged, although with the advancement of computing power since its original inception, the original restriction of a maximum of 1000 panels has now been removed. The user must specify the geometry of the body in a specific order, which essentially consists of vertices describing a series of vertical cut-planes, starting at the nose of the fuselage and proceeding to the rear of the fuselage. Unlike most aerodynamic codes, because the code assumes non-lifting flow conditions, the geometry can be terminated early and the full fuselage does not have to be input, if desired. The code runs on a standard Windows PC. Run times for a flow solution are only a matter of a few seconds (very much less than the time it takes to set up the required input geometry definition). The user may specify the flow Mach number if a compressible flow correction is required, but this is not normally required. The user also specifies the pitch and sideslip. 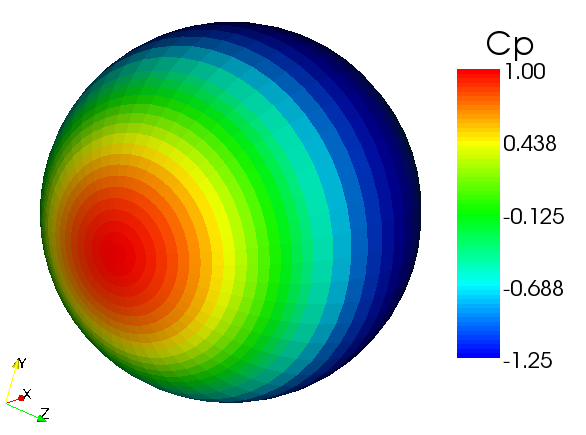 Unlike most modern flow solvers, the geometry is rotated to give the required pitch and sideslip and the direction of the flow remains fixed and is along the global x-axis. Up to three symmetry planes can be modelled but this option is currently disabled, i.e. a full section of geometry must be input. The ‘frames’ describing the body geometry can be spaced at different intervals, allowing fine spacing in the area of most interest (small panels) and larger spacing in regions of which the flow is of lower importance (such as the aft section of the fuselage). The user specifies a start point in the free-stream (usually at least seven reference chord lengths upstream) and the code uses a standard fourth order Runge-Kutta numerical integration routine to evaluate the new position of the droplets after a small (non-dimensionalised) time step. The integration time step is reduced automatically by the code as the droplet nears the body surface (so as to maintain the numerical integration accuracy). The numerical integration continues until the droplet either impacts the surface of the body or passes outside a user specified box (domain). The numerical integration assumes only aerodynamic forces (drag) act on the droplet. The water droplet drag law used is the same as that employed in codes such as LEWICE (NASA) and TRAJICE2 (QinetiQ/DERA). A further drag law is available for large (non-spherical) droplets (e.g. Super-Cooled Large droplets, SLD). 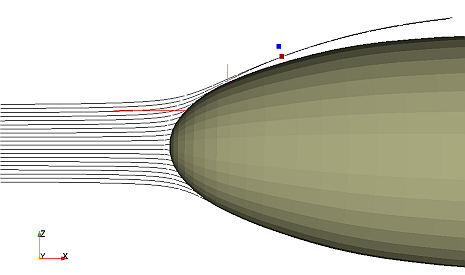 An example of the calculated trajectories about the nose of an elliptically shaped body are shown below. The flow direction is from left to right. A ‘dead-band’ in which no trajectories (the black coloured tracks) pass on the upper surface aft of the nose can be clearly seen.